If you missed the April Ryan lecture from the 2018 Women of Color Task Force conference, you may view it on our YouTube at https://youtu.be/2a1BEifuw50. 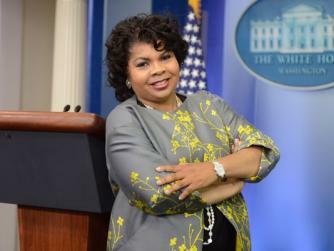 April Ryan is the only African American female reporter covering urban issues from the White House, a position she has held since the Clinton era. Since 1997, she has served as a White House correspondent and is the Washington, D.C., bureau chief for American Urban Radio Networks. In 2017, she joined CNN as a political analyst. In May 2017, the National Association of Black Journalists named Ryan as the “Journalist of the Year”. Ryan has been a member of the White House press corps for American Urban Radio Networks since January 1997 and has long been the only black female reporter among the White House correspondents. She is a member of the National Press Club and is one of only three African Americans to have served on the board of the White House Correspondents Association.